Knowing what antique marks are is great, but actually seeing them on real antique collectables is better. Viewing the antique manufacturers markings as they are stamped, painted or impressed on an antique item can help you learn more about how the maker marked their pieces and where and what to look out for. The gallery is where you can view a range of antiques and collectables from our own antiques collection and if you are a Google Plus user you can add your own comments or ask questions about the items. You can view the full Antique Collectables Gallery here and watch the slideshow, clicking on one of the images in the gallery will open the image and give you more details for that specific item. The antique collection items featured here are just a small preview of the full antiques gallery. 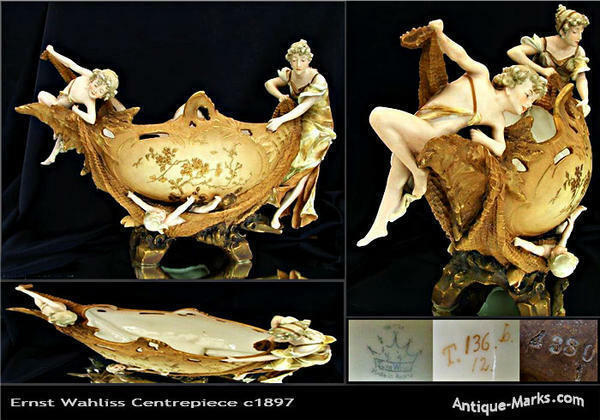 In antique marks, what the antiques collector is looking for is a historical reference point. A makers mark that will provide the collector with an indication of the maker, the decorator and the approximate date of manufacture. However the marks on antique collectables can and have been faked, so the collector must then rely on the quality of manufacture, the quality of design and the quality of decoration to confirm that what they have is genuine. The antiques collector can only do this by making sure they are familiar with the quality and style of a particular maker and by understanding the various elements within a makers mark as well as how and when those elements were introduced and utilised. Most antique collectors, particularly those who specialise in one maker or one type or style of antique will be able to tell instantly whether an item is genuine. Most will be able to spot an antique in their particular area of expertise from a distance. They learn to do this by becoming familiar with antique items and the makers they are interested in. Make sure you gain maximum benefit from our antique collectables gallery; to help you do the same. Cloisonne Ware - Is it Worth Collecting?